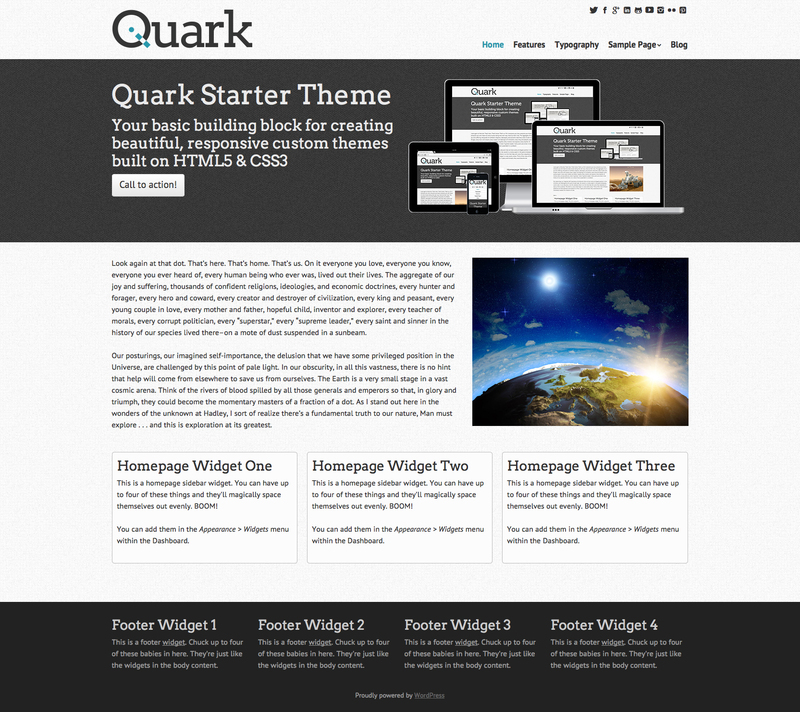 Quark is your basic building block for creating beautiful, responsive custom themes. It’s not a convoluted or confusing framework that’s hard to learn. It’s a simple and elegant starter theme built on HTML5 & CSS3. It’s based on the Underscores (_S) and TwentyTwelve themes, so that means not only is it flexible, it’s extremely easy to customise. There’s no need to make a child theme (unless you really want to), just dig in to the code & use it to give yourself a kickstart in creating your next awesome theme. Its base is a responsive, 12 column grid. It incorporates the latest version of Normalize.css (v2.1.0) for making sure that browsers render all elements more consistently and in line with modern standards. As well as the latest version of Modernizr (2.6.2) for detecting HTML5 and CSS3 browser capabilities. Creating Theme Options is super easy with the inclusion of the Options Framework by Devin Price and it includes over 300 gorgeous, retina friendly icons. Powered by Font Awesome, these icons are infinitely scalable and extremely easy to style using css. 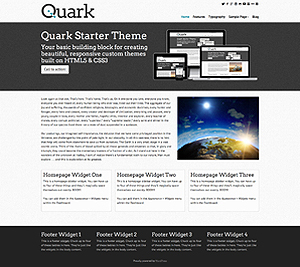 Quark includes a set of your most common theme templates, including templates for Full-Width pages, Left Sidebar, Right Sidebar (default), Front-Page, Tag, Categories, Authors, Search, Posts Archive and 404. All the standard WordPress Post Formats are supported. These include; Aside, Gallery, Link, Image, Quote, Status, Video, Audio, Chat and of course, your std post. Widgets are a great way of adding extra content to your site and Quark has a whole assortment of them. The Front Page Banner Widget areas are dynamic! You can use up to two of these and they’ll magically space themselves out evenly. For example, if you only add widgets into the First Front Page Banner Widget Area, then it will expand the full width of the page. However, if you add widgets to both Front Page Banner Widget areas, they’ll magically space themselves out over two columns. The Homepage Widget areas are also dynamic! You can use up to four of these and they’ll magically space themselves out evenly. For example, if you only add widgets into the First Homepage Widget Area, then it will expand the full width of the page. However, if you add widgets to all four Homepage Widget Areas, they’ll magically space themselves out over four columns. The Footer Widget areas are dynamic too! You can use up to four of these and they’ll magically space themselves out evenly. For example, if you only add widgets into the First Footer Widget Area, then it will expand the full width of the page. However, if you add widgets to all four Footer Widget Areas, they’ll magically space themselves out over four columns. There are three ways to install your theme. It can be installed by manually uploading the files to the themes folder using an FTP application, it can be installedby downloading from the WordPress Theme Directory within the Dashboard or it can be installed by uploading the theme zip file that you downloaded. Use the following instructions to install & activate Quark using your preferred method. Since Quark is a starter theme to kick of your own awesome theme, the first thing you want to do is copy the quark theme folder and change the name to something else. You’ll then need to do a three-step find and replace on the name in all the templates. Search for quark inside single quotations to capture the text domain. Search for quark_ to capture all the function names. 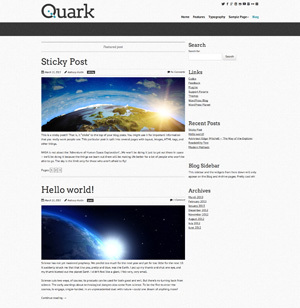 Search for quark with a space before it to replace all the occurrences of it in comments. Lastly, update the stylesheet header in style.css and either update or delete the readme.txt file. Quark is licensed under the GNU General Public License version 2.